The two countries have economic and strategic interests in developing relations. While the tight bond that has formed between Japanese Prime Minister Shinzo Abe and Russian President Vladimir Putin may seem a bit odd on the face of it, the reality is that the two leaders need each other in ways that are very significant to the future prosperity of their countries. Since Abe and Putin took office in 2012, the two leaders have met on ten separate occasions, becoming so familiar that they are now on a first-name basis. Russia’s annexation of Crimea in March 2014 put Russo-Japanese relations on ice as Abe was forced to side with the G7 group of industrialized nations in applying pressure and sanctions on Moscow. Washington in particular pressured Abe’s government to suspend talks with Russia in an effort to maintain a united front. On November 9, however, Abe and Putting managed to swing a brief conservation on the sidelines of the Asia-Pacific Economic Cooperation summit in Beijing. According to a Yomiuri Shimbun report, during the conversation Abe managed a verbal confirmation that Putin would visit Japan sometime next year. There is widespread hope among government officials in Tokyo that an Abe-Putin summit will put Japan and Russia on track to settle the Kuril Islands (the Northern Territories in Japan) dispute and finalize a formal peace treaty that has been on the shelf since the end of World War II. 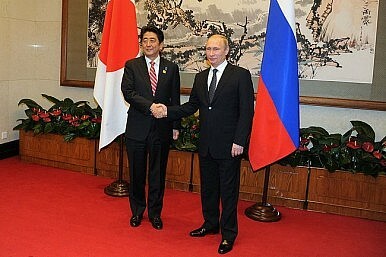 Putting the Kuril dispute to rest would have significant benefits for both countries, particularly Japan. Japan desperately needs to diversify its energy supply. Three years after the Fukushima disaster all of Japan’s 48 nuclear reactors remain offline. Before the 2011 Fukushima meltdown, nuclear power provided 30 percent energy of Japan’s needs. In the three years since the shutdown Japan’s already massive energy imports skyrocketed to 97 percent, 90 percent of which comes from the unstable Middle East. Abe has been persistent on the need to restart Japan’s nuclear reactors to curb fossil fuel imports, but so far remains on the losing end of the debate and has left to the decision to restart up to local communities. The Russian Far East (RFE) is virtually an untapped source of oil, natural gas, diamonds, timber and other raw materials that would not only help diversify Japan’s energy supplies, but also its economy as a whole. Further, the region’s close proximity to Japan would slash transportation costs and eliminate the risks inherent in shipping large, valuable cargoes through potentially hostile waters. As a signal of warming relations, in 2012 Russia and Japan announced plans to build a $13 billion dollar liquefied natural gas plant, along with a new Mazda assembly plant, both in the Russian warm water port of Vladivostok. Russia has also expressed strong interest in attracting Japanese investors to develop a robust agriculture sector throughout the RFE. Alongside the obvious economic benefits, Japan’s entry into the RFE would have considerable geopolitical significance. A peace deal with Russia would free up Japan’s northern security concerns, allowing a shift of military assets south, closer to other disputed territories. Also, China is by far the biggest player in the RFE. Russia’s largest trading partner, China is also the biggest market for natural resources coming from the RFE. Chinese have been crossing the border in large numbers for years in search of clean water, farmland, and job opportunities. Indeed, Chinese migrant workers represent a large majority of the labor force in the RFE. Russia not only prizes Japanese money and technology for developing the RFE, but also a Japanese presence to counter the growing Chinese influence in the region. When, not if, the Japanese forge ahead with large-scale investments in the RFE, it will give a boost to Japanese economic and political clout and provide a nice counter to China’s regional impact. Ricky Hough is a freelance writer and consultant in Tokyo. Don’t expect major breakthroughs anytime soon, but recent summits have moved the relationship forward.